Today's revision to the first quarter GDP report didn't contain any new news. The stock market is still (uncomfortably for many who worry that falls typically follow rises) near its all-time highs, both nominally and in real terms, and Treasury yields are still close to their all-time lows. It's a mixed bag, full of worry and caution. 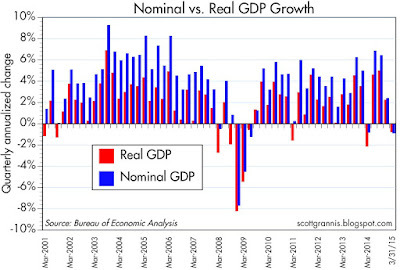 The relatively small decline in first quarter GDP is hardly more than a blip on the long-term chart (above). 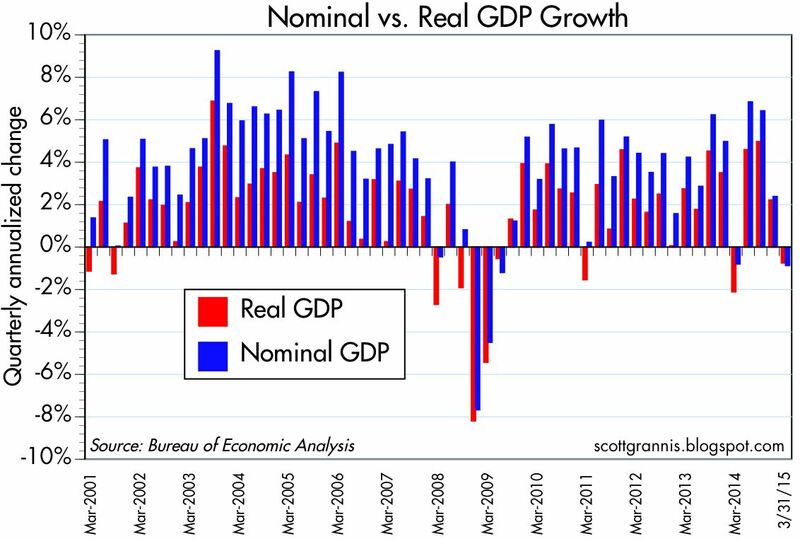 Over the past two years, GDP has grown at an annualized pace of about 2.4%, which is the same rate of growth that has prevailed for the duration of the current expansion. Nothing has changed. 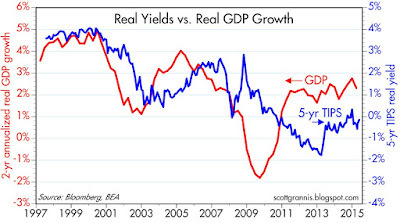 The real yield on 5-yr TIPS is priced to continued weak economic growth. Weak quarters happen every now and then. They don't necessarily precede recessions, nor do they make recessions more likely. It's quite likely that growth will bounce back in the current quarter—such are the vagaries of GDP accounting. 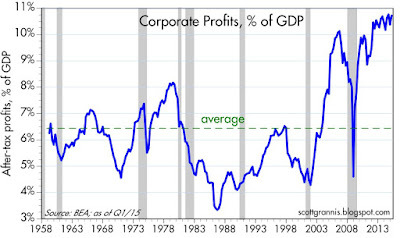 After-tax corporate profits continue to grow, and they remain very strong relative to GDP. 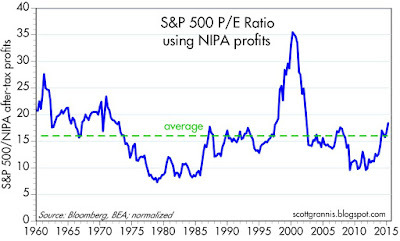 Yet PE ratios are only moderately above their long-term average. This suggests the market is still very skeptical that profits can continue to rise. Both the National Income and Products Accounts and the reported earnings of the S&P 500 appear to be growing at about the same pace. By both measures, profits are at an all-time high. Using NIPA after-tax corporate profits as the "E" and the S&P 500 index as the "P", PE ratios are moderately above their long-term average. Nothing unusual at all about this. 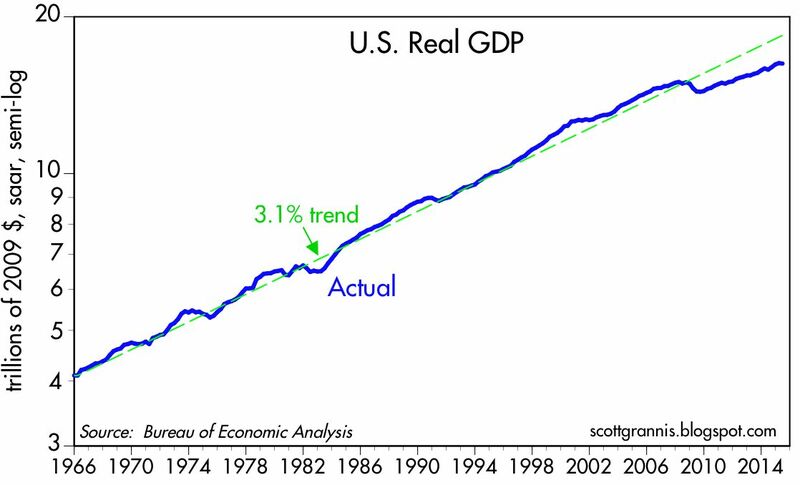 The market was quite exuberant in 2000 by this measure, but is still relatively cautious today—considering how strong profits are relative to GDP. Blogging may be light for the next week or so, as we are embarking on a trip to Italy in a few hours. Sure, Q1 was only one quarter. But does it make sense to talk about raising interest rates when we are in headline deflation and shrinking economy at the same time? 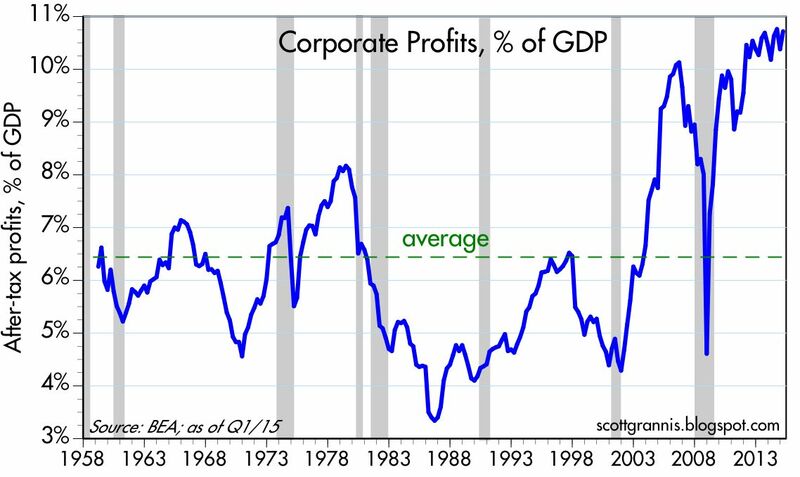 An interesting question: corporate profits exploded in the Bush W years then fell down in the recession and then reached new heights in the Obama years. What caused this profit explosion post-2000? Great points. I think there may be drift issues with S&P index and NIPA accounts. I think nonfinancial corporate profits and nonfinancial equity market value from flow of funds more or less mimics the S&P 500, but without this drifting issue because of the difference in construction, at least for nonfinancial firms. 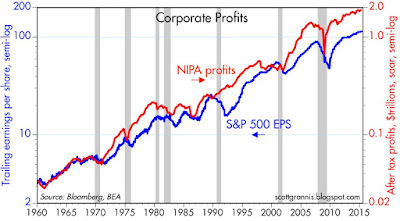 I think there might be composition issues in your corporate profit/GDP graph, too. In terms of sustainable corporate activity, your profit number includes foreign operations and also includes higher proportional profits that are accruing to shareholders because firms have greatly deleveraged. Total returns to domestic corporate assets are stable as a proportion of GDP and of corporate enterprise value. I hope I don't sound like a know it all. Great posts. Just some input I thought might be helpful. Not only do I agree with Ben but I am highly suspect that we'll see the fed move this year at all. It was only during the Fall of last year and the ebola scare that some fed officials were openly discussing a QE 4! the reason stocks are trading where they are with nary a correction in years is the perception among investors that there will be a fed "backstop" and frankly, given the fed's tendencies, I think they're right. Your friend at Calculated Risk seems to think that 2 per cent GDP is the new 4 per cent and it's all due to demographics and nothing new in the economy to juice the numbers. Look out for a melt up as we approach the presidential election. Same slow growth until then. There is no reason for households and corporations to have this much cash on the sidelines. If just the available cash was put to work, GDP could easily double? Folks are fearful of what the "next" recession will do for them. Forward looking guidance by the Fed has reduced spending by creating more fear. We need an infrastructure bill now and maybe the preception that gridlock is ending will start private investment. I need a new bass boat but have waited. My former company suffered greatly in the last recession. Tom: buy the new bass boat. Too many years can go by....and then you realize they are not coming back. Scott, what do you make of Schiller's PE ratio?? 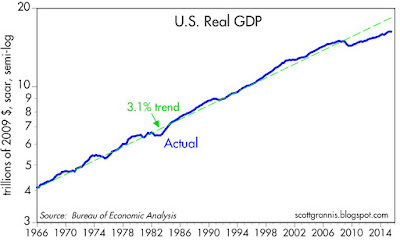 steve: If Shiller's PE ratio is relatively high it is mainly because corporate profits in recent years have been exceptionally high, relative to GDP, than they were in the past. 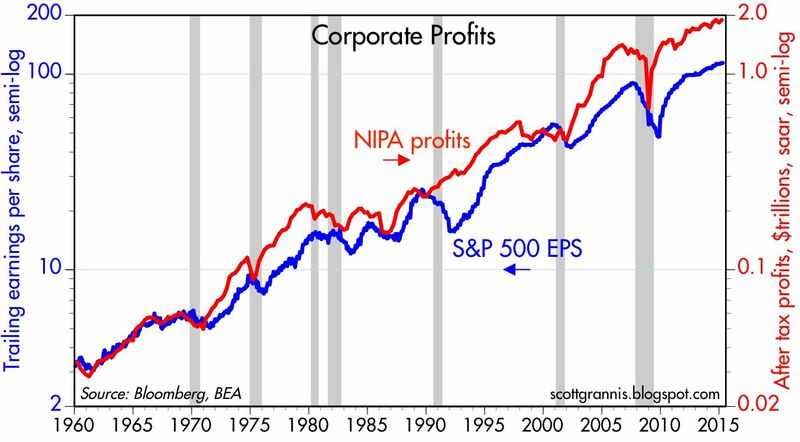 Does this mean profits have to collapse, or does it mean that globalization has changed the outlook for corporate profits going forward? I favor the latter explanation, which in turn means I'm not troubled by the Shiller PE ratio.